The thing at the bottom a mutated version of the inverted locust, the downward facing humanoid head in the painting has been squashed somewhat but becomes part of the the lower body with the cheek transforming into an oval form, one might even want to compare it to the eye lid in Dali's painting, suggesting that it would then be a merger between the two because of the eyebrow line and eyelid shape showing up around the oval. 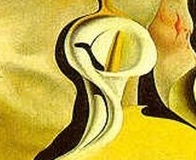 What else takes form in Giger's painting is the merging of that shape with the soft architecture with the oval in it at the bottom right of Dali's painting which I will label as the rogue oval doughnut hole. The head at the top being the man's shorts with the mouth being the woman's nose intersects with the testicle are. 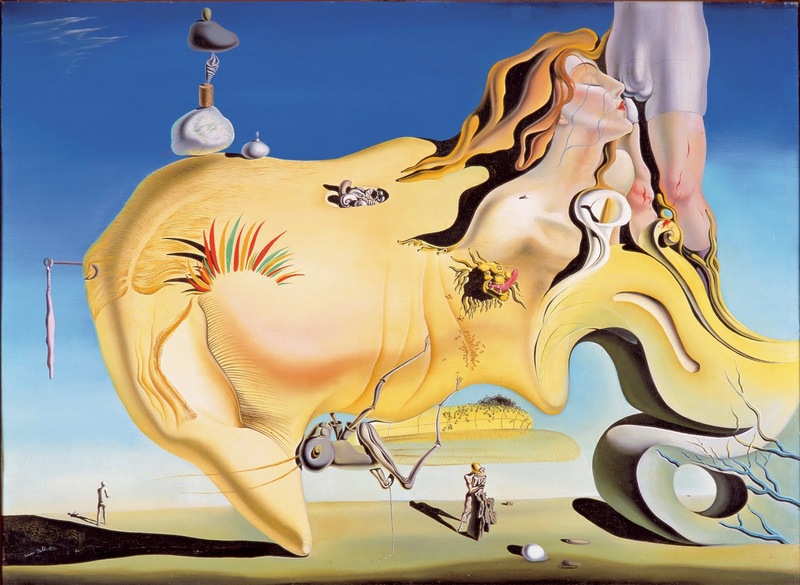 The general position of her eye had and face has been abstracted turned into the Cala lilly like form in Dali's painting as well. Perhaps this area that would be the face has also been merged with the rogue oval doughnut hole as well as the head of the creature at the top. to the right of the rib beneath the clavicle of the woman being the white crescent shape in Giger's picture. Meanwhile the space between the clavicle and the rib become transforms into the oval space by the white crescent shape. 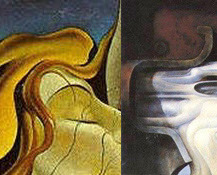 The front of the woman's hair almost taking on a tentacle like form transforms into the pipe opening on the left. The rogue oval doughnut hole once again. This piece of soft architecture with hole and branches in Dali's The Great Masturbator and window with three ovals in Giger's Homage to Beckett. 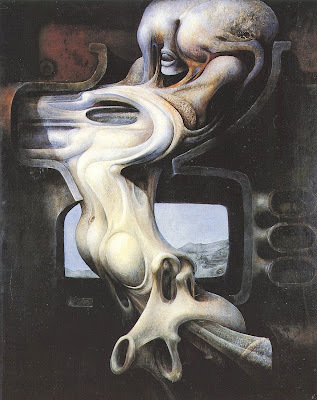 The window in Giger's painting with the three oval pipe openings at the side would be inspired by the shape at the bottom right with a hole in it as three branches next to or intersecting with it. Thanks for bringing up the subject. I've been getting into some depths with analysis of Giger's work. Probably a few more things to consider about this painting still.